This page will walk through Angular 2/4 route guards CanActivate and CanActivateChild example. In the Angular application in which authentication and authorization is required to navigate a route, the role of Angular route guard comes into the picture. There are many API of route guards but in this article we will discuss CanActivate and CanActivateChild. Both API works in the same way. CanActivate and CanActivateChild are interfaces and have methods canActivate() and canActivateChild() respectively. These methods return Boolean value. CanActivate is used for authentication and CanActivateChild is used for authorization. To use route guards in our application, we need to create a service and implement these interfaces and define their methods. Angular Route interface provides canActivate and canActivateChild properties to configure service class which is implementing CanActivate and CanActivateChild interfaces. In our demo application user is authenticated by entering username/password using login page. User has two roles ADMIN and USER. We have a dashboard layout route and its children routes and they are protected by CanActivate and CanActivateChild. When we try to access any protected route, the current routes will be saved for future use to redirect here and we will be redirected to login page. Once the user is logged-in, user will be redirected to saved route. In our application we have some routes that are only accessible to a user with ADMIN role. Now find the complete example to create our application with route guards step by step. Find the technologies being used in our example. Find the project structure of our demo application. Guarding routes means whether we can visit the route or not. For example in login authentication based application, a user has to login first to enter into the application. If there is no route guard then anyone can access any link but using route guard we restrict the access of links. To achieve route guards, Angular provides following interfaces that are contained in @angular/router package. In this article we will discuss CanActivate and CanActivateChild. CanActivate decides whether we can navigate to a route or not. It is used to redirect to login page to require authentication. CanActivateChild decides whether we can navigate to child routes or not. It is used to decide link access on the basis of authorization. It is possible that those links accessible to ADMIN role, will be not be allowed to USER role. Let us understand how to use CanActivate and CanActivateChild route guards. 1. CanActivate is an Angular interface. It is used to force user to login into application before navigating to the route. 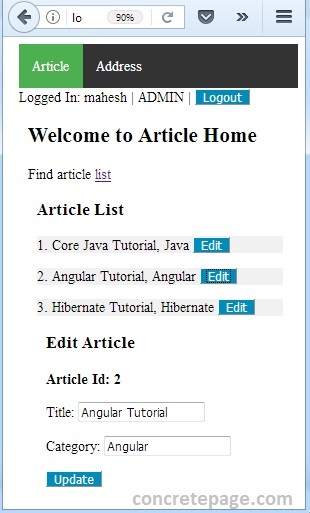 Find the declaration of CanActivate interface from Angular doc. CanActivate interface has a method named as canActivate() which has following arguments. ActivatedRouteSnapshot: Contains the information about a route associated with component loaded in outlet in particular time. It can traverse router state tree. RouterStateSnapshot: It is a tree of activated route snapshots. It has url property that gives the URL from which this snapshot was created. canActivate() returns boolean value or Observable or Promise of boolean value. 2. We need to create a service implementing CanActivate interface and override canActivate() method. 3. Use canActivate property of Route interface to guard the route and assign service class implementing CanActivate interface, for example AuthGuardService. Now find the canActivate property used in route declarations. If canActivate() method from AuthGuardService returns true only when route can be navigated. In case of false value, navigation can be redirected to login page. 1. CanActivateChild is an Angular interface to guard child routes. Suppose a user has been authenticated but not authorized to visit the child routes, so child routes can be guarded using CanActivateChild. Find its declaration from the Angular doc. Method signature of canActivateChild() is the same as canActivate() . 2. We need to create a service implementing CanActivateChild and override canActivateChild() method. 3. Use canActivateChild property of Route interface to guard the route and assign service class implementing CanActivateChild interface, for example AuthGuardService. Now find the canActivateChild property used in route declarations. In the above route declarations child routes can only be accessed if canActivateChild() method returns true. We can create a path without component. It is useful to guard child routes. Find the code snippet which is using canActivateChild with route that has no component. We will provide a complete example to guard routes using CanActivate and CanActivateChild. We will create a login application for authentication. When we try to navigate any route and if we have not logged in then we will be redirected to login page. After logged-in, user can navigate protected routes. In our application there are two types of role, ADMIN and USER role. We will allow user to access some routes on the basis of authorization. We will restrict some routes for user with USER role and will be accessible only for ADMIN. Authentication will be done using CanActivate and authorization will be done using CanActivateChild. First of all we will create a service that will authenticate a user. We will also create a method to check if user is logged in, setter and getter method for redirect URL, method to get login URL, method to get logged in user and method to logout user. Find the service that is implementing CanActivate and CanActivateChild interface. canActivate() will return true if user is already logged-in. If user is not logged-in already then the current route will be saved and user will be redirected to login page. 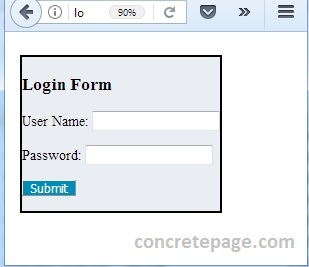 In login component, once the user successfully logged-in, user will be redirected to its saved URL. canActivateChild() will return true, if user role is ADMIN. This is used with child routes when we want to restrict unauthorized access. In our application we have routes that will be accessed only by ADMIN role and not by USER role. Find the routes guarded by canActivate property. We have used canActivate property at layout entry point. When we try to navigate routes of layout or its children, the routes will be guarded by canActivate. In the service AuthGuardService, the method canActivate() decides whether we can navigate to protected URL or not. Once the user has logged-in, canActivate() will return true and user can navigate to protected URL. Find the application module used in our example. Find the routes guarded by canActivateChild property. canActivateChild guards the child routes of a route that is using canActivateChild property. It works in the same way as canActivate. In the service AuthGuardService, the method canActivateChild() returns true if the user role is ADMIN. When the canActivateChild() returns true, the protected children routes can be navigated otherwise cannot be navigated. Find the article module used in the example. We will create a login application here. If user is not authenticated, and user tries to access the dashboard layout route or its children route then it will redirect to login route saving the current route in login service. Once the user is logged-in, the login component will redirect the user to route saved in login service. Login service code has been given on the start of article. Now find the other files of our login application. For the route guard demo, we have created an article application. A user can visit the article and edit the article. There is also an address component used in our demo. Now find the rest of the components used in our example. To test the application, find following steps. 1. Download source code using download link given below on this page. 2. In your angular CLI application, replace src folder from the downloaded one. 3. Run ng serve using command prompt. We will be redirected to login page. In our demo we have two user roles ADMIN and USER. User credential with ADMIN role is mahesh/m123 and user credential with USER role is krishna/k123 . Now login with ADMIN role user mahesh/m123. User with ADMIN role can visit every link in our application. 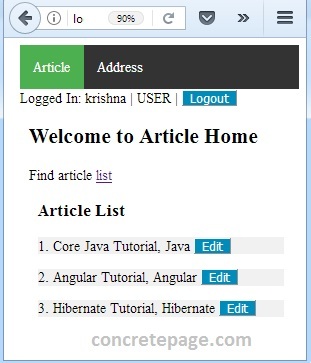 Now login with USER role krishna/k123 and click on the Article > list. User with USER role is not authorized to edit article. I am done now. Happy Angular learning!